Zoisite is a green stone similar looking to aventurine and is found in Africa. 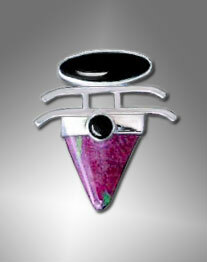 Ruby in zoisite is a form which has ruby crystals imbedded throughout the stone. This is not gem quality ruby, to be sure, but it is a very striking looking stone and makes an unusual color combination.